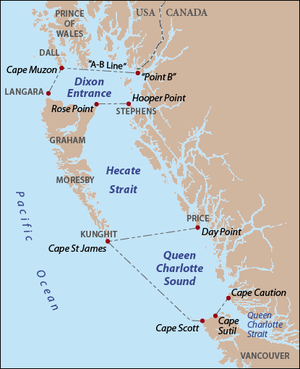 The Dixon Entrance as delineated by BCGNIS and the disputed "A-B Line", along with Hecate Strait and Queen Charlotte Sound. Red dots indicate capes and points, gray text indicates island names. The international boundary between Canada and the United States follows Portland Canal to "Point B", thence, according to Canada, to Cape Muzon. The purpose and significance of the "A-B Line" portion of the boundary are disputed. 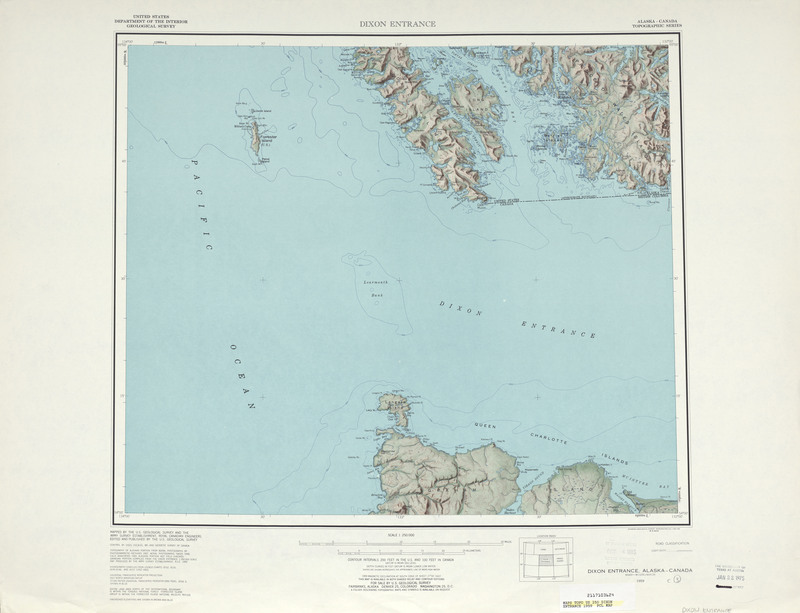 The so-called "A-B" line (approximately 54°40'N), which marks the northern boundary of the Dixon Entrance, was delineated by a court of arbitration set up by the 1903 Alaska Boundary Treaty. The meaning of the line remains in dispute between Canada and the United States. Canada claims the line is the international maritime boundary, while the United States holds that its purpose was only to designate the land masses belonging to each country. Hence, the U.S. does not recognize the "A-B" line as an official boundary (to govern, for example, seafloor resources or fishing rights). In 1977 the U.S. defined a maritime boundary as an equidistant line between land masses. The two differing boundary lines intersect to create four separate water areas with different claim status. The two areas south of the "A-B" line (about 2789 km2 and 51.5 km2 in size) are claimed by both countries. The other two water areas are north of the "A-B" line and are not claimed by either country. The two unclaimed areas are about 72 km2 and 1.4 km2 in size. In addition, Nunez Rocks is a low-tide elevation ("bare at half-tide") that lies south of the "A-B" Line, surrounded by the sea territory claimed by the U.S. The United States has not ratified the Law of the Sea Treaty, although it adheres to most of its principles as customary international law. Under the treaty, LTEs may be used as basepoints for a territorial sea, and the U.S. uses Nunez Rocks as a basepoint. As a non-signatory, however, there is nothing preventing the U.S. from claiming areas beyond the scope of the Law of the Sea Treaty. The fact remains that, for about half of each day, above-water territory that Canada regards as Canadian is surrounded by sea territory that the U.S. has declared to be American. Territorial fishing disputes between the countries remain today, as the United States has never shown the "A-B" line as a boundary on its government maps. Maps of the Dixon Entrance showing the A-B Line of 1903 (left) and the boundary currently claimed by the U.S. (right). ↑ Middleton, Lynn (1969). Place Names of the Pacific Northwest Coast. Victoria: Elldee Publishing. p. 65. OCLC 16729415. ↑ The islands on the south side of the Entrance which are officially named Haida Gwaii by the Province of British Columbia in 2010, at the request of the Haida people. The new name, meaning "land of the people", originated in the 1970s. These islands are still quite widely known by their historical name, the Queen Charlotte Islands. 1 2 3 Gray, David H. (Autumn 1997). "Canada's Unresolved Maritime Boundaries" (PDF). IBRU Boundary and Security Bulletin. pp. 61–63. Retrieved 2015-03-21. ↑ U.S. National Geodetic Survey. "NOAA Shoreline Data Explorer". Retrieved 2015-04-10. ↑ Mirasola, Chris (March 15, 2015). "Why the US Should Ratify UNCLOS: A View from the South and East China Seas". Harvard Law School National Security Journal. ... much of UNCLOS is based on customary principles of international law to which the U.S. already adheres. ↑ "Dixon Entrance (USGS, 1959)". Retrieved 2016-03-03. ↑ White, James (1914). Boundary Disputes and Treaties. Toronto: Glasgow, Brook & Company. pp. 936–958. ↑ Davidson, George (1903). The Alaska Boundary. San Francisco: Alaska Packers Association. pp. 79–81, 129–134, 177–179, 229. 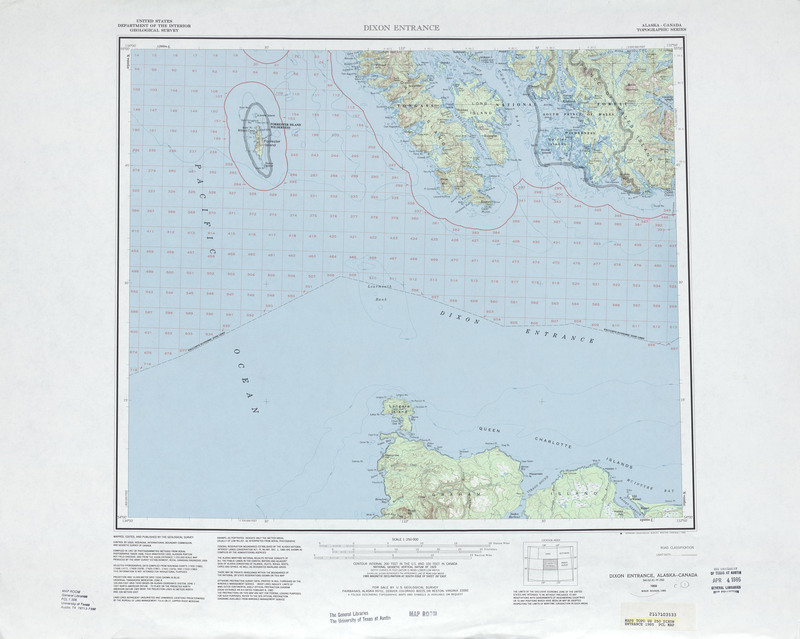 ↑ "Dixon Entrance (USGS, 1985)". Retrieved 2016-03-03.